alaTest ha raccolto ed analizzato 120 recensioni su Babyliss 7898U Super Stubble Trimmer. La media della valutazione per questo prodotto è 4.4/5, confrontata con la media della valutazione di 4.3/5 per altri prodotti. Abbiamo analizzato differenti valutazioni di esperti ed utenti, età del prodotto ed altri elementi. A confronto con altri prodotti, Babyliss 7898U Super Stubble Trimmer ha ottenuto un alaScore™ complessivo di 87/100 = qualità Molto buono.
" Very hard to use, batery life realy bad "
" Very happy with it, easy to use and works well. " " It gives a comfortable cut, but one can argue on the power behind the blade. When moving on dense hair you have to hover again and again. But it's a nice product overall. Definitely recommended. " " A little expensive. 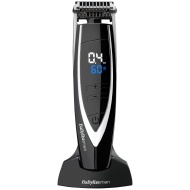 But does the job "
BaByliss for Men 7898U Lithium Super Stubble Trimmer.
" Does the job very well, good piece of kit. When fully charged it lasts for ages. " " The pain of managing my facial hair over time has been a battle of attrition and then I discover the BaByliss 7898U Lithium Super Stubble Trimmer. Can't say enough about this marvel of design and engineering. Thank you! " " Good for beard shaping and trimming my husband was happy to get this as a gift "
" expensive but works well and easy to use, had the earlier model for a few years before it packed up and this one is an improvement "
" I had pervious model before, it was good but luck of water proof but this model is excellent with water proof including "